The walls have come tumblin’ down. The Germans and Austrians have thrown their borders wide open. Syrian migrants in their tens of thousands are pouring in. Soon there will be almost a million of them, with an endless queue forming behind them. Word will get out to Africans and Asians: “The West is weak. They have given up. Their resistance is broken. 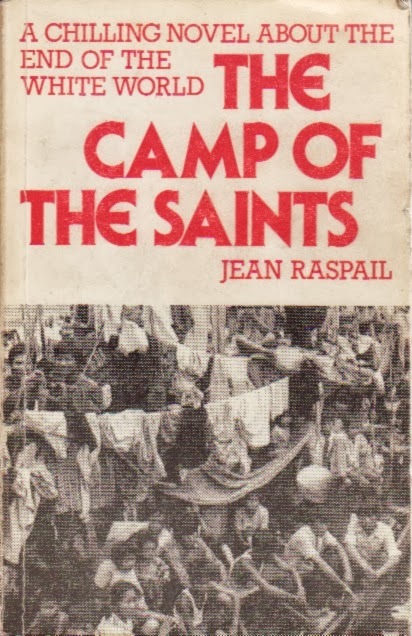 Pick up your bags and let’s join the stream.” Jean Raspail’s Camp of the Saints nightmare has come to pass. We will remember this day for the rest of our lives. This is the day we lost our civilization. The enemy is within our gates, and more and more will pour in. We are finished. This is the end. Or at the very least, the beginning of the end. And to think that it took just one image, one photo of a three year old boy lying dead on a Turkish beach, to shatter our resolve and turn the tide. One image was the straw that broke Europe’s back. I can’t find any words to describe my feelings at this point. A composite of impotent rage, despair, fatalism? It is hard to say. What does one say when he bears witness to the unfolding displacement, conquest or extinction of his tribe, and the destruction of a legacy that reaches back to ancient Athens? What do say when you realize that the people in your family who gave their lives to save Europe seven decades ago evidently died in vain? And what of the heroes centuries ago who beat back the Muslim invaders at Tours and the Battle of Vienna? It seems in retrospect, that their victories were just a holding action. Europe survived the Muslim and Mongol invasions, but it has succumbed to an incursion of an unarmed army of wretched refugees. It is as if, before our eyes, European-based culture in North America, Australia and Europe is being torn apart by a pack of wild dogs. One dog is Middle Eastern, one dog is African, one is Central American, another is Chinese and another is South Asian. And many of them are Muslim. Some of us are fighting back. Donald Trump. The Prime Minister of Hungary. The President of the Czech Republic. Populist politicians who are vilified by the mainstream media and shut out of power. But they are the beleaguered few. Will this be their Last Hurrah? We could have stopped the flood. But our leaders lacked the will, and too many people were making money selling out their country. There is no conceivable punishment that could be meted out to these despicable traitors that would be commensurate with their crimes. What retribution would be fitting for Angela Merkel? What is the penalty for betraying one’s people and murdering their heritage?